An environmental company, CSC, had been contracted to respond to a lead and asbestos concerns after several apartment complexes in Van Nuys, CA flooded. On February 1, 2011 many residents of the 16400 block of Vanowen Street awoke to a sudden surprised. Around 3:00 in the morning the Fire Department responded to numerous calls indicating that the area was flooding. After a quick investigation by the Los Angeles Fire Depatment, it turns out that a water main broke releasing thousands of gallons of water, which impacted businesses, homes and apartment buildings. Before the sun had risen, approximately 60 people had been displaced by the rising flood waters and the American Red Cross had been called to the scene. 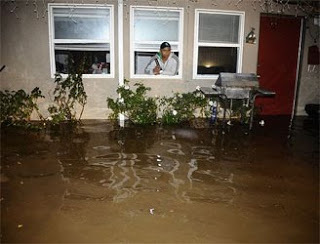 Reports by the media indicate that the flooding waters were deep enough to float people’s belonging within their homes. After further investigation, a massive hole had developed within the middle of the street where the broken water main once lay. The water main has since been turned off and repairs are underway. The building occupants will be on alert for indoor air quality issues and mold growth as they return to their homes and businesses.